The HTC gallery is a custom job, but stacks photos just like the vanilla Android gallery (it used to display a list of thumbnails). The app automatically locates images and videos, no matter where they are stored. You can choose to show/hide camera shots, All photos or All videos. Once you pick one of the "stacks" (each standing for a folder), you're presented with a grid of the photos inside. Some photos have an icon indicating it's not a single photo but a burst shot instead. You can later go back and pick the keep or the one to be used as a thumbnail. The HTC One V supports multi-touch and you can take full advantage of it while browsing your images. You can zoom to 100% with a simple double tap on the screen. The implementation here is extra smooth too. There's no dedicated video player app onboard the HTC One V, video files can be accessed in the All videos subfolder in the Gallery. The video playing interface on the HTC One V offers a view mode toggle (full screen or best fit) and you can scrub through videos. There's a shortcut that lets you adjust screen brightness and another one to take screenshots of videos. Video codec support was decent, but the One V had issues with a few of the DivX files we threw at it. On the other hand, all supported videos ran smooth up to 720p resolution, which is good for a single-core unit. Due to the lack of DLNA connectivity, wireless streaming is a no-go on the One V, as opposed to the One X and S.
The now playing interface is a thumb visualization of the current playlist - you can swipe sideways to skip songs back or forward. You can opt to view the full playlist if you need to skip more than a few tracks. You can tap the ellipsis to automatically fetch album art for a track or look it up on Google or YouTube. The One V offers the Beats Audio sound enhancement to boost the sonic experience - you can use it with any headset you want. You can choose between multiple presets - Beats audio, classical, bass boost and so on or turn the effects completely off (audio purists, rejoice!). The lockscreen has a card that shows the album art and name of the song and artist along with playback controls. Strangely unlike on the One X and S you can't drag the card into the lockscreen interactive ring. 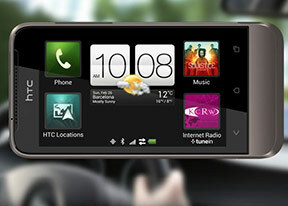 The HTC One V is also equipped with an FM radio, which has a pretty simple interface. It automatically scans the area for the available stations and allows you to mark some of them as favorite. It also supports RDS and allows loudspeaker playback. You can play the sound through the headphones or the loudspeaker. You can also choose Mono sound if the reception is poor. There's no Beats enhancement here, tough, or a playback control card on the lockscreen. The HTC One V managed to put up a solid performance in our audio quality test. Its output was impressively clean when connected to an active external amplifier, as shown by the great scores all over the place. Volume levels were only average, though. 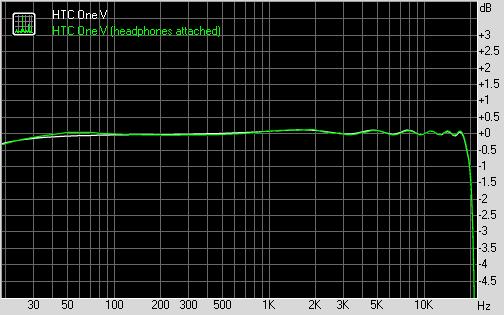 Some stereo crosstalk did appear when we plugged in a pair of headphones, but that’s basically all that went wrong, so it’s certainly a more than great overall performance. Here go the results so you can see how the One V did for yourselves.